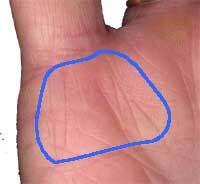 Do you have palm reading psychic hand markings? Do You Have Mercury Mound Lines? Vertical lines on the Mercury Mound are called a "Medical Stigmata" in traditional palmistry. That means the "mark of a healer". This is a powerful mark that should be understood and used to help guide one through life. Easy access to the inner voice and psychic realms. That inner voice can bring wise insights and profound wisdom from unknown psychic sources. You should always listen to this inner psychic voice for guidance, especially in dealing with other people. Often the inner psychic voice will tell you something that conflicts with your ego or conscious desires. FORGET THOSE and go with the inner voice! Honest communication from the heart and psychic realms. This subtle level of true communicating is rare, but it is especially rewarding. It takes a brave person to TRULY say what touches them at their deepest heart levels. A well rounded Mercury Mound with these verticals indicates much more than just an ability to speak from the heart. It indicates a powerful need to fulfill the life purpose. You have a unique ability to help people heal their karmic wounds. [Read and understand this carefully. It is subtle and easy to miss the point.] The ability to help and heal is something you learned how to do along your karmic path in past lives. The lines indicate you are wired in this lifetime to use your psychic ability. Now your lesson is to CHOOSE to do the helping and healing. You don't have to do it if you don't want to. Truthfully, helping others to heal themselves is not a lot of fun after awhile. But here is the big secret: If you do choose always to use your natural psychic powers to help others heal their own karmic wounds, then more miracles than you can imagine will happen in your life. If you choose NOT to help and heal, then not much will happen except you will live a boring, stuck, problematic existence. Most people do life that way. And one last very important point: Don't go out in the world and try to RESCUE all the sick, lame and lazy. "Helping" is about teaching a person how to help them self. "It is much better to teach a person to fish than to give them a fish." If you have these Mercury Mound vertical lines your most important CHALLENGE is to live as a teacher and healer to everyone you meet every day. It is not easy at first. But the more you do it, the more you will find that little miracles occur to help you. Your life will become much easier and more spiritually rewarding. Really! What a deal!